My third marathon is in the books. A 12 minute PB on a super hilly course. The 4 mile long hill from miles 21-25 was pretty mean! But I got it done and I can't wait for my next marathon in October. My TomTom watch syncs to both Runkeeper and Strava, both of which I used to visualize my 16 week training program. The routes for each run are in the form of GPX files, with a data point for every second of the run. I created this Alteryx workflow to parse those files and create the routes I needed to visualize in Tableau. I then used the Strava web data connector created by The Information Lab to get the summaries for each run. When designing the dashboard, I wanted the focus to be on the map, so I allocated the most space for that. I used the Mapbox Outdoor theme map because it's very similar to what Runkeeper uses. I made the lines red so that they stand out against the map and then added indicators for the start, end, and each mile. Above the map, I wanted to display the stats for each run (from Strava). I added a calendar on the right to show the frequency of my runs (I must admit I'm pretty consistent). The user can click on a date to see the details and map for that run. Lastly, I added elevation and pace charts. I'm not all that pleased with how these turned out, but it'll have to do. So that's about it. 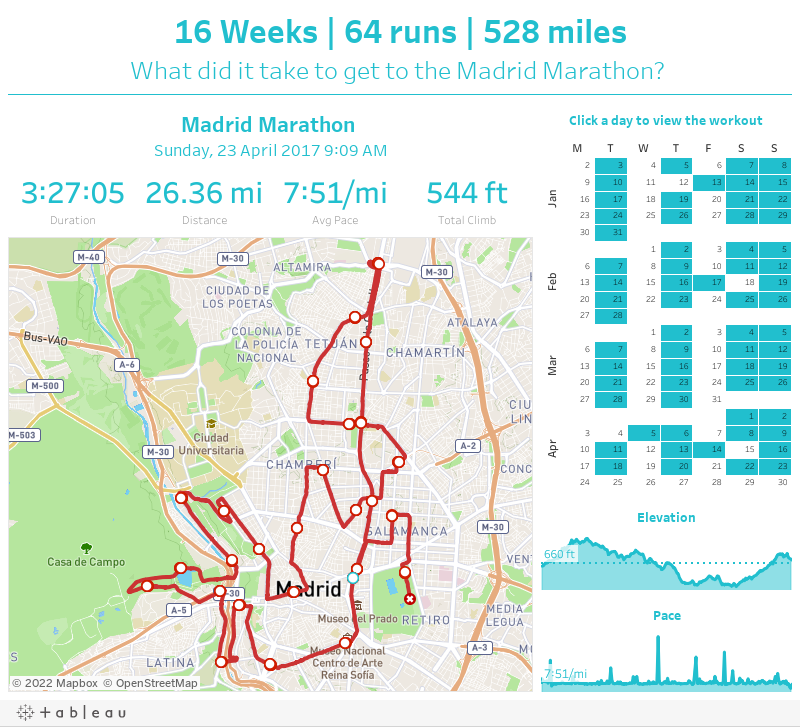 16 Weeks | 64 runs | 528 miles - that's what it took to get to the Madrid Marathon.